The current crisis in Nepal is not fuel crisis, but it is identity crisis which is rapidly moving towards humanitarian crisis. David Caprara, an international journalist reporting Madhes protest from Nepal to international media, told this while speaking at a program organized by the Tarai Madhesh Study Group at Jawaharlal Nehru University (JNU), India. Caprara, who is in Delhi after having reported the issue from the ground for the past five months and witnessing the unfolding of this crisis, came to the JNU to share his experience on the ongoing Nepal crisis with the participant students from Nepal. In the event, he spoke on ‘Nepal Crisis: A discussion examining the roots and motives behind, the blockade in Nepal, Madhesi protests, and why this is important to India.’ He also suggested that Nepal government should address the question before the agenda is picked up by the small group of separatists of Nepal. “The fuel crisis cannot be understood without understanding the Madhesi crisis and it will be resolved once the government addresses the genuine demands of Madhes,” Caprara said. During his stay and experience of following the issues on ground and reports in the media, he found that the mainstream media in Nepal has been very biased. It has remained very prejudiced toward Madhes, and ignores its demands, hence people of other communities are ignorant of their legitimate demands, he argued. Caprara said that the Madhesi parties should unite, and plan to achieve their goal without much loss. Addressing the Nepali students, he emphasized that the state should respect human rights, and stop human rights violations. The program was attended by students of Delhi University, JNU, South Asian University, Indian Institute of Technology and other educational institutions around Delhi. Please watch the video of some of his talks from the program. David Caprara is a U.S. reporter who has published with VICE, The United Press International (UPI), and the Kathmandu Post; and is currently working on projects with Al Jazeera, NBC, and Columbia University School of International and Public Affairs. Tarai Madhes Study Group is the group of Nepali students at JNU. 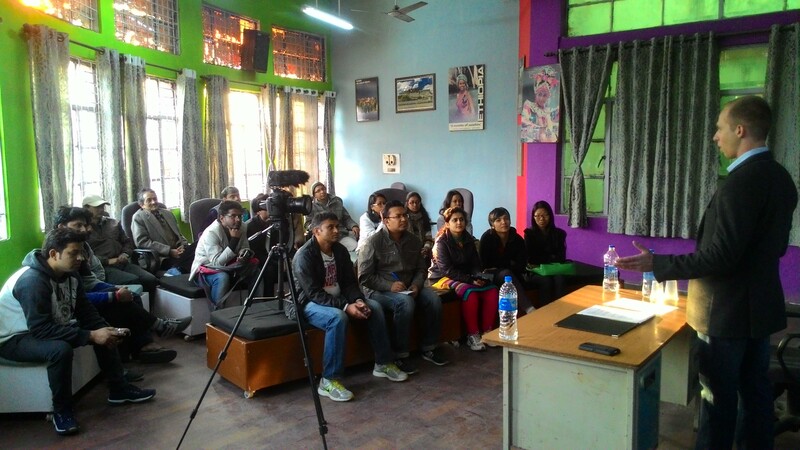 The motive of the group is to understand and raise awareness on the issues of Madhes. Bikash Mishra hails from Birgunj, Nepal. He is a research scholar at School of Environmental Sciences, Jawaharlal Nehru University (JNU), New Delhi.